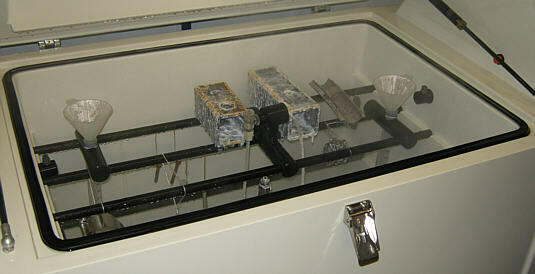 We are able to simulate harsh corrosive environments using our salt fog chamber. Salt spray testing is ideal for testing the corrosion resistance of metals, metallic coatings and protective coatings applied to metals. It can also be used to assess the corrosion resistance of metal coatings applied to plastic substrates particularly if they are intended for marine applications. Materials Technology offer the neutral salt spray test ( NSS ) as standard, which is perhaps the most commonly used salt spray test, and is performed with a solution of NaCl (typically 5%) at a neutral pH between 6.5 & 7.2. The duration of the test can range significantly, but will typically run from 500-1000 hours. However short duration tests of 48-96 hours are also possible. We are also able to accommodate the other test types, including Copper Accelerated Salt Spray(CASS), Acetic Acid Salt Spray (AASS) and Sulphur Dioxide Injection. For items that require a significant outdoor life a test duration of 1000 hours is recommended. The CASS test and the AASS test have been found to be especially useful for testing decorative coatings of copper+nickel+chromium, or Nickel+Chromium. They have also been found suitable for testing anodic coatings on aluminium. Sample size is generally not an issue, as the fog chamber is large enough to accommodate most samples or complete products. Test plates of 150mm x 75 mm are often used for the assessment of paints and coatings but tests can also be conducted on whole products. Typical examples include ruggerdised PCs for military use, cable cleating and painted metal plates. Like UV weathering there is no direct correlation between accelerated salt fog testing and real outdoor exposure. The reason for this is that the outdoor environment is inherently variable on a day to day basis. However, general experience has shown that 1000 hours of exposure is equivalent to several years of outdoor exposure. Some industries equate this to a 10 year life. Despite this, salt spray testing is widely used in industry for the evaluation of corrosion resistance of finished surfaces or parts in order to predict relative suitability for use in service or as a quality control test. 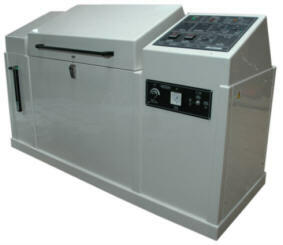 It is an ideal test to perform when comparing different suppliers or the effectiveness of different coatings. Ultraviolet light can often impair the integrity of industrial coatings, reducing their protective effect. A combined test using both UV weathering exposure followed by a Salt Spray testing can provide additional information about the effectiveness of the coatings in the real world. We can conduct custom cycles or can recommend typical cycles for you. Materials Technology offer a range of accelerated environmental tests including salt spray testing, UV weathering, long term ageing studies and climatic cycling.